This design brings amusement and practicality to an otherwise purely functional product. 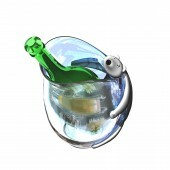 It is part of a range of domestic culinary products taking inspiration from the polar regions. It employs polymers to reduce weight and improve safety. The double skin of the polycarbonate main body is filled with a silicone gel which helps maintain the temperature of the contents when the bucket is pre-chilled keeping ice water colder for longer. It brings colour and a talking point to dinner parties where it becomes a 'table sculpture' as well as functional object. The materials and appearance make it suitable for an informal gathering of friends. The polymer body is lightweight making it easier to carry when full of ice and water. It is less likely to form condensation making the surfaces slippery and the well-defined lip makes emptying easy and holds the bottle effectively. 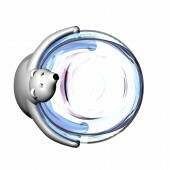 The enclosed form helps maintain temperature while the polyamide ‘bear’ provides good grip for carrying. The project was begun in June 2012 and concept designs were completed in August. The product comprizes injection moulded polycarbonate shell with polyamide grip. The grip is overmoulded with a soft touch silicon finish and the void between inner and outer shell is filled with a silicone gel. 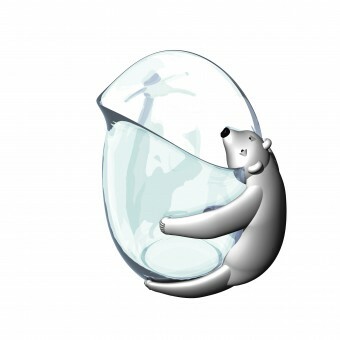 Bear Hug, cooler, wine, table sculpture, informal dining, ice bucket. I researched existing wine related products and found many to be well engineered but clinical with stainless steel and glass the predominant materials used. I surveyed retailers who reported that most sales were to men in a more mature age bracket falling into a stereotypical profile. I therefore set up a focus group of young people of mixed gender who saw informal dinner parties as a preferred way to get together with friends. The focus group stated that utensils were important to these occasions and owned a range of products known for their visual impact as well as their function and liked the conversation provoked by such pieces. Well respected technologies were deliberately chosen to ensure that the product could be put into production. The main challenges were firstly visual in achieving a balance between the eye-catching and the functional which was achieved through good feedback with the focus group. Secondly the ergonomic and safety challenge which affected the selection of materials, size and shape. Bear Hug Bottle Chiller/Ice Bucket by Clive Bullivant is a Nominee in Bakeware, Tableware, Drinkware and Cookware Design Category. 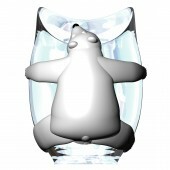 Bear Hug Bottle Chiller/Ice Bucket by Clive Bullivant is Winner in Bakeware, Tableware, Drinkware and Cookware Design Category, 2012 - 2013. · Read the interview with designer Clive Bullivant for design Bear Hug here. 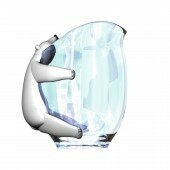 Did you like Bear Hug Bottle Chiller/Ice Bucket? Help us create a global awareness for good kitchenware design worldwide. Show your support for Clive Bullivant, the creator of great kitchenware design by gifting them a nomination ticket so that we could promote more of their great kitchenware designs.